The warrior with the burning head tentatively crosses the black bridge. He’d finally made it further than ever before. He’d blitzed his way through the prison dungeon, crept his way through the dim turquoise forest, and leapt through the battered ramparts. Now, the warrior treads cautiously. Ahead he can see a looming, mutated figure. On sighting the warrior, the creature roars and begins to stomp towards him. A short while later, the warrior’s broken body smashes lifeless against the cold stone floor of the bridge. Moments after that, he revives back in his prison quarters to start his journey all over again. 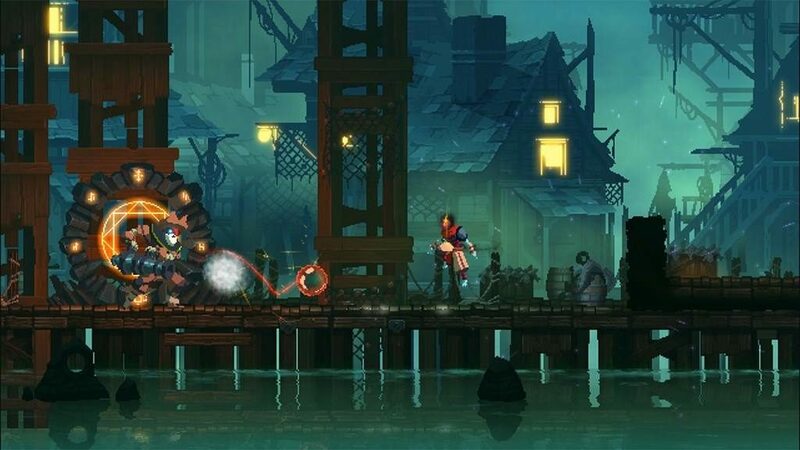 Dead Cells, from developer Motion Twin, is a stylish 2D action-platformer that I’m sure some reviewers will call a ‘Metroidvania’ game with modern improvements. Fortunately for you, I have very little experience playing that style of game. Sometimes a fresh, naive set of eyes is what you need. Dead Cells’ story is minimalist. The game allows the player to piece together elements of the plot and worldbuilding by stumbling across rooms and reading notes. In spite of this style of storytelling being something I’m enamoured with in similar games, I wasn’t impressed by the story Dead Cells tells. Still, this is one of those rare instances where I’ll admit I’m not playing this game for the rich characters or pathos. 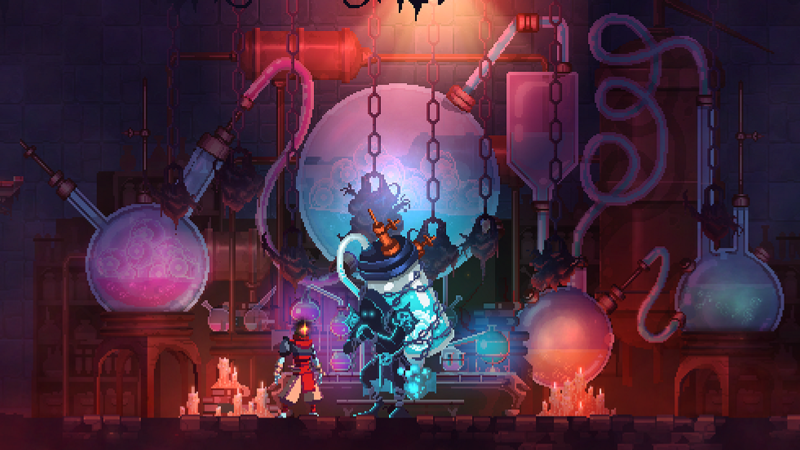 I’m playing Dead Cells to harvest some goop and get swole. The premise: you play as a parasitic slime, a disembodied mass of immortal cells capable of possessing headless bodies. Once firmly seated in your latest host body, you have one simple goal: get the hell off the island you’re currently imprisoned on. And, as it turns out, you’re a kung-fu master, comboing, jumping and rolling your way to freedom as you progress through the world. And what a world it is. If anyone needed confirmation that 2D pixel art can hang with photo-realistic AAA titles, they need look no further than this game. Its vibrant colour palette combines with a dilapidated horror landscape to create an instantly memorable gaming landscape. In the Ramparts area, for instance, the player character streaks across the prison’s late dusk rooftops, a shadow against the defiant setting sun, as towers scroll in parallax behind you. The levels are designed beautifully, each section distinct and well-balanced. The character designs double down on Dead Cells’ artistic strengths. The player character is immediately identifiable, smoky, burning head billowing out from a lean warrior’s physique. Hopefully, we’ll see the character cameo in other games, following in the successes of other characters like Shovel Knight. Enemy types tend to share this visual quality. Early enemy types are quite generic and simplistic, shambling puke-green zombies or Robin Hood-esque archers. However, later enemies have much more visual, and combat, complexity. A personal standout is a pirate enemy that patrols the Stilt Village, a cannon-carrying brute that can both fire explosive projectiles and batter you to death with the thing. More games ought to have pirates in. The idea is that every time you die, you’ll come back smarter than before—and, sometimes, more powerful. As you progress through each level, you’ll pick up Cells and gold from defeated enemies. If you make it to the end of a level, you can spend your accumulated Cells on permanent upgrades for your character, such as new weapons (from blueprints you obtain from enemies), more health potions, or the ability to carry over gold into the inevitable next run. However, if you die before reaching these end-of-level checkpoints, you’ll lose all of your Cells. Unlike a lot of Souls-inspired games, Dead Cells doesn’t even give you the chance to retrieve these Cells. Sorry, buddy. Every time you die, the level layouts change. According to the plot, the island is an organic being which evolves, adapting to your progress. This prevents the game from getting stale; however, there is no stand-out level design due to this randomisation. You’re still playing with all of the same, designed, level sections. They simply get swapped in and out, remixed, on every death. Additionally, I never felt that the island was actually adapting to my style; the levels never actually seemed to counteract my ‘roll-n-slash’ strategy. Dead Cells has a huge amount of weapons and tools. I don’t think I’ve even encountered all of them in my playthrough. Each weapon has a different moveset, and you’ll come across different weapons every time you respawn. At times, you might be stuck with a certain weapon type that might be uncomfortably slow, or not hit hard enough for your liking. Whenever this happened, I simply kept a classic mantra in mind: “git gud, scrub”. As infuriating as that mantra can be, I think the advice works well in regards to Dead Cells. I died multiple times against the game’s bosses, which, for some, could be mildly frustrating, especially if you’d had a good run prior to your tragic demise. However, it’s simply a learning experience, right? You’ll get ‘em next time. Like other skill-based action games, once you learn the enemy’s attacks and patterns, you’ll be blasting through the levels until you hit a new zone. The weapons and tools, combined with the mutation mechanic which allows you to get a specialised buff at the end of every level, allow you to build playstyles that suit your run. You can build towards a hyper-aggressive life-stealing DPS fiend, a whirling ballet of dagger slashes and rapid arrow shots, or play cautiously, baiting enemies into the range of well-placed traps or turrets. The latter was how I eventually beat that first boss. I only had the one problem with the game’s combat variety. I never found the shields to be very useful, given the usability and feel of rolling. The few times I found a use for them was when I was learning new enemy patterns. Usually, however, I’d be rolling around with a melee weapon and a ranged weapon, and even if I were to pick up a well-designed, unique shield, I’d rarely use it. Given the Sheer, Unlimited Power of the dodge-roll, the shield spaces might have been better served by even MORE melee weapons, but that’s just my personal, Bloodborne-skewed bias. The game’s attempts at humour, fortunately, spread thin in my time playing it, are often more miss than hit. Ranging from physically painful to nearly-a-smirk, the game’s jokes are juvenile at best and soulless at worst. They serve more as an indictment of internet culture than as a glaring flaw of the game itself, as they are missable and infrequent. However, I felt uncomfortable about a joke where, upon finding a somber room with a suicide, the Prisoner shrugs before punching the hanging body for loot. Yikes, Dead Cells. Alright. Little bit callous. If this sequence was played seriously, the Prisoner would take equipment from the dead man due to necessity. That angle might work, but here, it was clearly played for laughs. I played Dead Cells on the Switch, and I did notice a few odd performance issues. A frame-rate dip here, a split-second freeze there. There wasn’t anything game-breaking, and frankly, I don’t think the issues influenced my enjoyment of the game in the slightest, but the developers were aiming for a flawless 60FPS. Motion Twin are currently prioritising fixing this issue and bringing the Switch port up to the standard of the other platform releases. Dead Cells is a brilliant, challenging game empowered by powerful visual design and addictive combat. It’s few flaws do little to detract from the overall experience, even if the story could have done with a little more time in the oven. While taking inspiration from many classic and modern titles, Motion Twin’s latest effort confidently stakes a claim to its identity thanks to bold design choices and mastery of game feel.